Mon - Wed and Sun 5pm - 1am, Thu - Sat 5pm - 2am. No tennis shoes, hats, T-shirt or baggy pants. The House of Blues Foundation Room, sitting atop Mandalay Bay, is one of the most exclusive clubs in the city. Besides Las Vegas, the Foundation Room has locations in New York City, New Orleans, Chicago, Los Angeles, Dallas, and Houston. It is a "members only" club, with the general public allowed access in Vegas on Monday nights. Accessible only by a private elevator, the Foundation Room is located on the 60th floor high above the city. 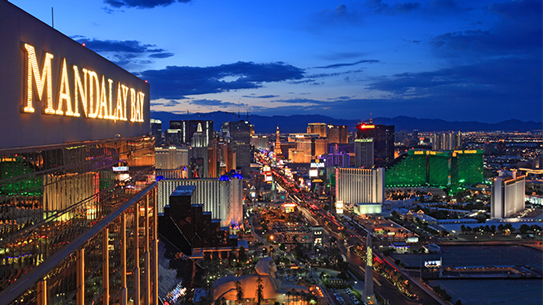 There's an outdoor balcony with breathtaking views of the Strip and the Vegas valley. 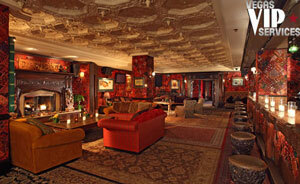 The Foundation Room will make you feel like you're being transported to Tibet. The color scheme is deep red with dark wood with artifacts including a giant Buddha statue. There's a large fire place in the main room surrounded by comfy sofas perfect for conversation or relaxation. There are private rooms, a media screening room, and a few bars, making the Foundation Room one of the few venues where you can dance to loud music or escape to a quieter corner for an intimate conversation. The Foundation Room is for members from 5 p.m. seven nights a week. Non-members may party at the Foundation Room Monday nights from 11 p.m. to 5 a.m. at a special after-hours party called "Godspeed." Contact Vegas VIP Services to reserve your Bottle Service at Foundation Room Las Vegas. Foundation Room Nightclub Review by Samantha G. You. on Nov 12: It is the most exclusive members only club in Las Vegas, there are live concerts and great crowd.